Well, it’s one day away from the dreaded draw, that simple tradition that can have even the most hardened racetracker shuddering in fear and apprehension. This is the last hurdle to clear, and if you don’t, it could mean four months of training, racing, worrying, and dreaming right down the proverbial drain. Those agonizing minutes when the pills are being pulled are every horseman’s nightmare. Once you get past this hurdle unscathed, it’s just two days of waiting for the big moment. But the magic of the Kentucky Derby certainly is not restricted to owners, trainers, and jockeys. The race affects people all over the country in different ways, many of whom have Derby dreams of their own. For his 18th birthday present, Frank took Chris back to Los Alamitos and gave him $50 to bet legally for first time. 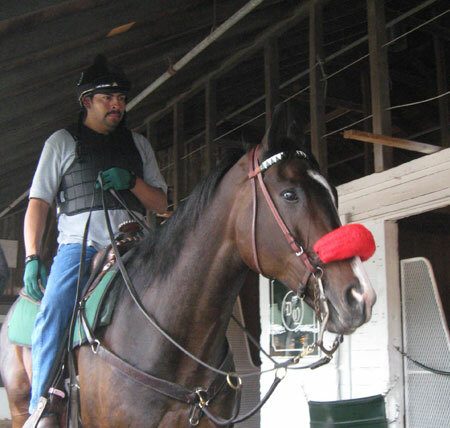 Chris and Frank were often accompanied to the track by Frank’s friend, Rod Lowe, and all three became very close during their travels to Los Alamitos and visits to Rod’s Quarter-Horse ranch. 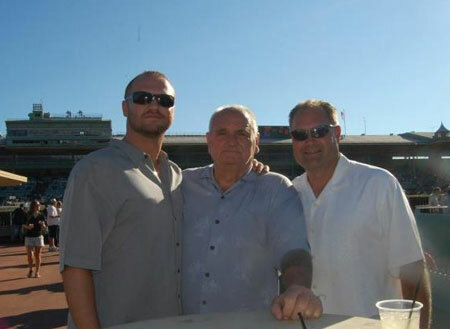 Chris Simonds, his grandfather Frank Clayton, and Rod Lowe at Santa Anita. Not long before Chris was deployed to Iraq, he promised his grandfather that he would return safely so they could finally attend the Kentucky Derby and fulfill their dream. It actually was a lot more than a wrinkle. Chris made a full recovery and was awarded the Purple Heart. This year, for his 30th birthday, he decided it was the right year to finally live his and his grandfather’s dream. 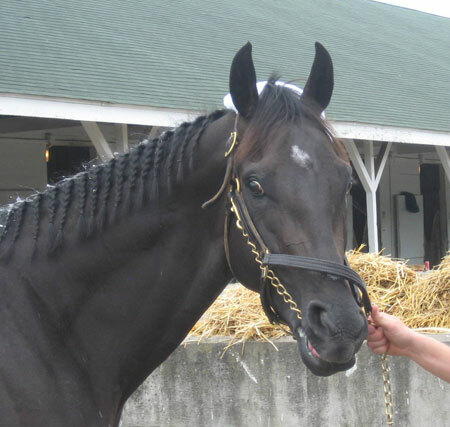 “With some savings, the generosity of many family members and friends, and help from Sita World Tours and Premiere Sports Travel (www.sportstravel.com), Chris and his grandfather, and Rod and are finally living their Kentucky Derby dream,” Lisa said. We know that Daddy Knows, or we should say Nose, Best, but does he or anyone else really know what Daddy Long Legs is going to do in the Kentucky Derby Presented by Yum! Brands (gr. I)? “Said O’Brien, “At home, Daddy Long Legs works well and is a good mover with an extravagant action. He’s a horse that likes eating and sleeping and only does what he needs to do. We’ve had a cold spell in Ireland with unseasonably bad weather which hasn’t been ideal, but he’s a very relaxed and straightforward horse to do anything with. O’Brien will remain in Europe Saturday to saddle Two Thousand Guineas (Eng-I) favorite Camelot at Newmarket. 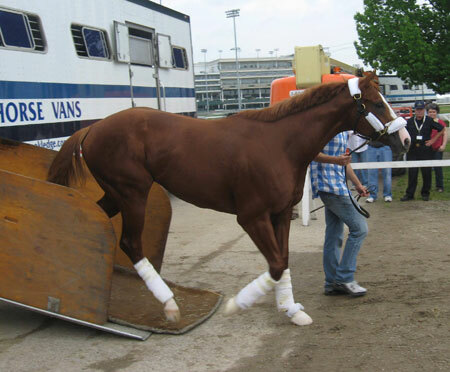 The Todd Pletcher-trained Gemologist and El Padrino finally arrived from Palm Meadows, along with Florida Derby (gr. 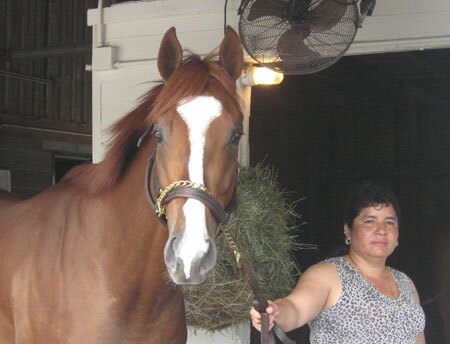 I) winner Take Charge Indy. 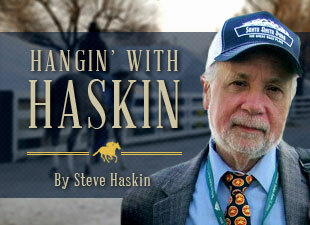 Both Pletcher colts were in fine physical form, with El Padrino making an immediate impression. He is a powerful, flashy-looking chestnut with a white face and makes a striking appearance. Take Charge Indy looked fantastic. The son of A.P. Indy has a refined classy, “Black Stallion” look about him and his coat had a beautiful shine to it, despite the cloudy, humid morning. He doesn’t look anything like his sire, but bears a close resemblance to his dam, the top-class Take Charge Lady. On the track for the first time Tuesday morning was Alpha, who arrived Monday evening just before 6:30. The smallish, narrow-bodied son of Bernardini had good energy coming off the track, spending most of his time looking at the crowd gathered along the rail. Rousing Sermon showed he likes this track, working a sharp five furlongs in 1:00 2/5, coming home his final quarter in :23 4/5 and final eighth in :12 flat, galloping out six furlongs in 1:14. There are a lot of things we’re liking about this colt, and can definitely see him coming on at the end and at the least being a part of the exotics. Our final words of the day: Welcome to the Derby, Mr. Lukas.